With the celebration of Earth Day in April, J.M. Field Marketing was reminded of the importance of doing our part to conserve the Earth’s natural resources and protect the environment. Restoring and protecting the Earth’s natural resources should be a priority for everyone—for nature enthusiasts, local residents, and for businesses that want to give back to the environment, save money and support a strong economy. Our economy and quality of life all tie back to the sustainability of the planet. For the past several years, J.M. Field Marketing has made a very deliberate effort to reduce, reuse, and recycle as much as possible. Three years ago, J.M. Field Marketing implemented a recycling program to recycle the large number of cardboard boxes used by the fulfillment department as well as its client’s old and unwanted brochures and catalogs. The cardboard boxes are routinely picked up three times during the week and the old and unwanted brochures and catalogs are picked up as needed by the local recycling company. In 2010, J.M. Field Marketing finally stopped using disposable coffee cups and instead distributed reusable coffee mugs to all the employees. Plus, in an effort to minimize the use of paper in the company, J.M. Field Marketing encourages employees to use the company server to save artwork files and other documents so everyone as easy access to it and to cut down on printing. In fact, J.M. Field Marketing has been able to conserve energy and reduce its electric bill since more and more employees turn off their office lights and computer monitors at the end of the day. Now fewer light bulbs can be seen burning in the offices throughout the building. 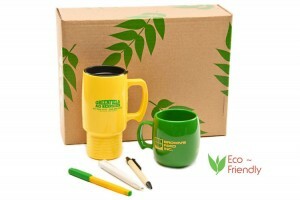 In addition, the company purchased reusable J.M. Field Marketing branded tote bags which are used by Account Managers to deliver product samples. Going green for J.M. Field Marketing has also meant providing our clients with green products and services such as printing brochures and other marketing materials on recycled paper, producing eco-friendly promotional products and designing “green” marketing campaigns to promote our clients eco-friendly message. We know that going green and personal responsibility to the environment will have a positive impact on the carbon footprint we all leave behind and simple changes do make a difference. 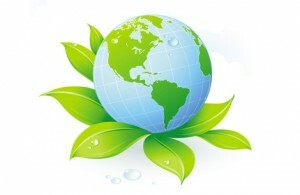 Plus, we know through first-hand experience that going green doesn’t have to be complicated or costly. When you’re ready to make the move to being more environmentally friendly, we can help you decide which promotional products and paper products are recycled, reusable, and biodegrade. Contact us today at 844.523.1957 or email info@jmfield.com.